Hi! One thing that you must know about me is that I love, love, love to travel, even though I don’t get to do it nearly often enough. I love seeing new towns and learning about the history and the people of all these places I get to visit, whether it’s right here in the States or across the planet. So, as I get ready to head on my next trip, I thought I’d take the next few weeks to share some tips and tricks I’ve picked up through the years that make my travel easier and more fun. But I have one big rule: pack light, never more than I can handle myself, which is usually one carry-on and one suitcase. That being said, there are a few things that most people don’t think to bring that I find absolutely necessary. Enjoy! Part 1: Where I Get All OCD | Part 2: You Look Mahvelous! This is such a fun post for me. I love keeping memories alive, and memories of my travels are some of the best. Besides the pictures and journals, we all drag stuff back with us to remind us of our adventures. Some do T-shirts, some do food, others choose post cards. But to me, those things either sit in a cabinet or don’t last. Or, on the other side, you end up with knick-knacks that do nothing and you have to dust. I have to confess, I do have my fair share of knick-knacks, though. My favorite: a replica of what some say is the Holy Grail. It’s on display at the cathedral in Valencia, Spain, and they actually sell little plastic replicas in the gift shop. It was so funny forking over cash cash to a nun (and she looked mean – like the kind who’d slap you with a ruler if you didn’t have exact change) in a gift shop in a cathedral that is centuries old. But I digress. Over the years, I’ve started to hunt for specific items to bring back with me that remind me of my trip year-round and almost let me relive it in many cases. 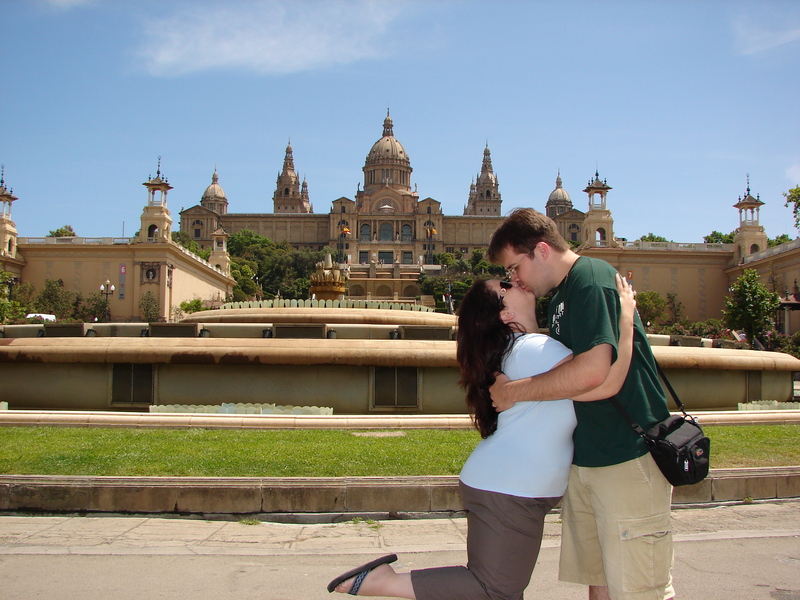 My hubby and I kissing outside the national art museum in Barcelona. Why? I wore that every day on that trip. Aquolina’s Pink Sugar takes me back to our babymoon/anniversary trip three years ago. It’s like people who say a certain cigar smell reminds them of their grandfather, or the smell of chocolate chip cookies baking reminds them of their mom’s kitchen when they were little. I’m sure there’s a scientific name for it, but I don’t know it. It’s been accidental, but this year I’m going to actively try it. I’m thinking of going with Victoria’s Secret Pear Glace this time. Just a note on this whole perfume/fragrance thing: don’t do something overpowering and don’t douse yourself with it, either. A little dab will do ya. Please be considerate of those around you. Cookbooks: Better than bringing back food with me that will be eaten or will spoil and never seen again, I like to find cookbooks so that I can make those dishes back home and transport myself back. I’m a bit of a cookbook junkie, so this may not apply to everyone. In Spain, I got a great baking cookbook that’s by a group of nuns that take care of the cathedral in Seville. Their simple baking has been keeping their convent around for ages. And I have their recipes. Just looking at it takes me back to the cathedral. Jewelry: I started this years ago, right after high school graduation. My ‘senior trip’ was to Cancun where everyone 18 and over went to get drunk. I wasn’t 18 yet, and wasn’t really into the binge drinking thing anyway, so I opted to go with the French club to Europe instead. Armed with the money I got as graduation gifts, I was determined to find something special. And somewhere in Switzerland, I found it: a tiny, simple, diamond-chip and sapphire-chip ring. I still love that ring and still wear it. I think it cost me a whopping $45. Since then, I try to find some sort of piece of jewelry when I go somewhere. It’s not a must (like any of these souvenirs), but it’s nice to get if I can. Christmas Ornaments: Over the years, we’ve gotten ornaments for our Christmas tree wherever we go. In the States, it’s easy – any tourist shop has them. But overseas, not every country has Christmas trees, so it’s been a little challenging finding something. You have to keep your eyes open and brain working. In Italy, I found little replicas of the big monuments (about the size of a quarter) and then super-glued some clamps to them when I got home. In Spain, I found miniature castanets on the last day of our trip. I was so excited to find them. Sometimes it can be a bit of a scavenger hunt, a fun little extra thing to do while we’re out and about. Now at the end of the year, when we put up our tree, we get to reflect on all the cool places we’ve been to. 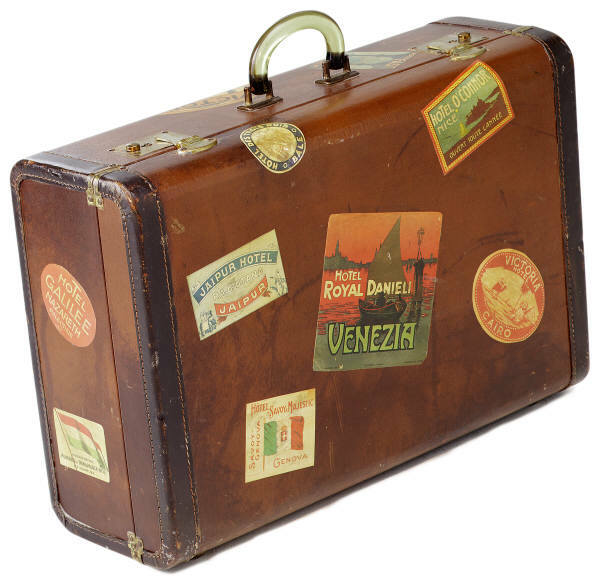 How do you keep your travel memories alive? This entry was posted in Travel and tagged packing list, travel list on June 1, 2012 by aliciamariel.